By Herman "Skip" Mason, Jr. The Civil Rights movement in Atlanta is most often equated with the tireless work and inspiring words of Dr. Martin Luther King. Jr.; however, a host of other courageous individuals, both known and unknown, came before, during, and after Dr. King to face the challenges of racism and segregation in the South. This unique pictorial history celebrates these people, their accomplishments, and the legacy they left for today's African-American youth in Atlanta. 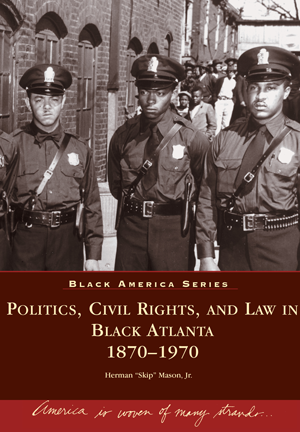 Included in Politics, Civil Rights, and Law in Black Atlanta are approximately two hundred historic images of the people, places, and events that shaped the movement in and around Atlanta from 1870 to 1970. The images are coupled with an informative and engaging text compiled by Atlanta historian Herman “Skip” Mason, Jr., who serves as the Dean of Students at Morris Brown College. Mason was honored with an Outstanding Georgia Citizen Award in 1999 for his work in preserving African-American history. This is his sixth title with Arcadia.